Attractive apartment, great location, great service.submitted by Ashley H. - Dec 01, 2018 |Recommended: YesFriendly and helpful office staff, responsive maintenance team, attractive apartment and community areas. Great location in a walkable town, easy access to highways and the train. 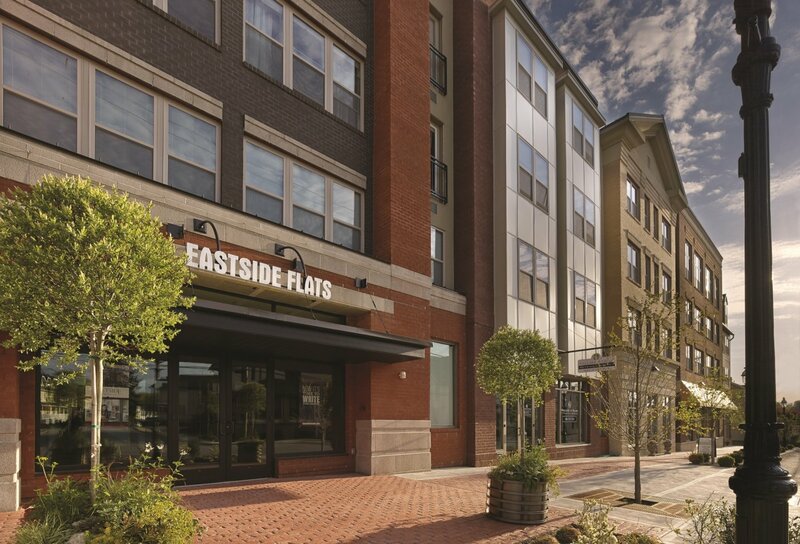 You cannot get a better locationsubmitted by Veronica W. - Nov 30, 2018 |Recommended: YesI love living at Eastside Flats. The amenities are really good, the apartments are gorgeous, and there's a great variety of floor plans. The only issues we really have are that someone or multiple people above us do not try to manage the amount of noise they make when they walk we joke there are elephants, it's pretty bad. It honestly doesn't even seem like it's an issue with the sound insulation, it's just a very inconsiderate person or persons. Otherwise I never hear my neighbors, everyone is relatively friendly, and it's a great place to live. The very short walk to the Regional Rail is the ultimate plus and is great for a commuter like me. Nice apartments that are well managed and in a very convenient location.submitted by Peggy W. - Jul 01, 2017 |Recommended: YesMy husband and I moved to Eastside Flats after selling our home of thirty years with the thought that we are now spending enough time at our second home in NYC and traveling that it seemed silly to hang on to the house. Our goal was to be able to lock the door and head off without any fuss. Eastside Flats has lived up to all of our expectations. The apartments are spacious with their own washers and dryers. We have been living here for six weeks and have been very pleased with the responsiveness of the maintenance staff on the few occasions we have needed to contact them. The front office staff are also very accommodating and friendly. Our apartment is surprisingly quiet considering we overlook King Street. The windows insulate very well. There is nicely planted outdoor space with seating and grills for barbecuing. Thus far I give Eastside Flats an A . Professional, Clean, and always invitingsubmitted by Jonathan M. - Jul 01, 2017 |Recommended: YesReasonable, great location, calm atmosphere as compared to other places. Professional, Clean, and always inviting environment. Love Eastside Flatssubmitted by Katie H. - May 03, 2017 |Recommended: YesI'm coming up on two years here at Eastside Flats and I love it here. The property is well kept, the management is very responsive, and my fellow residents are all very friendly. Malvern is a great little community, the quiet of the Suburbs, but steps away from the train to Philadelphia. This is homesubmitted by Adriane - Mar 16, 2017 |Recommended: YesEastside Flats is home with access to everything. Wegmens, Target and great shopping are all just a few minutes away so it feels like I live near everything I need. The train station is one block down making it easy to access Philly, NYC and the east coast via Amtrak. Downstairs is Christopher's and the Buttery which are so delicious and convenient its hard to leave home. The building is well maintained and the staff is super easy to work with and quick to respond. I've met some wonderful neighbors who have become dear friends and we use the building's amenities for movie nights, thanksgiving dinners or just siting by the pool. Honestly, I love living here and would recommend it to anyone.